The Career Center offers a variety of services to School of Education students and alumni. Read more about each type of service, how it can benefit you, and how to sign up for each service. Appointments are one-on-one or small group (at students’ request) sessions with a Career Consultant to get help or information about a wide range of career-related topics. Fill out the request form or call (608) 262-1755 to schedule an appointment. Can’t make it into our office? Ask about setting up a phone or Skype appointment, or assistance via email (not all services are available via email). The Career Center offers events each semester on a variety of career topics. View our current event listings. Events are open to undergraduate students, graduate students, and alumni affiliated with the School of Education. To register for an event, login to your Handshake account. Click on the event tab and sign up for events of interest. If you have any questions about an event, please contact career-center@education.wisc.edu. WERF is the statewide educator recruitment fair organized by the Career Center and co-sponsored by all the teacher education programs in Wisconsin. It provides professional educators from participating education colleges and universities in Wisconsin the opportunity to meet with school districts throughout the U.S. Held in early spring at the Monona Terrace, find further details and register for this annual spring fair at the WERF website. If you have questions, please contact career-center@education.wisc.edu. The Career Center collaborates with our career services partners across campus to hold fall and spring campus-wide fairs. These career fairs are promoted on the Career Fairs site once the date for each event has been set and confirmed. Visit the Career Services at UW-Madison page and Campus-wide Career Events calendar to view other career events on campus. Handshake makes it easy for every UW-Madison student to explore career events, connect to jobs and internships, and even schedule on-campus interviews. Questions? Contact the Career Center by email. Career Center staff are also available to help you learn how to most effectively use your Handshake account. WECAN, the Wisconsin Education Career Access Network, is an online posting and hiring system used by more than 500 Wisconsin K-12 schools and districts. View the WECAN user guide by clicking on “Applicant Help” from the WECAN homepage to learn how to create an account. Kaltura is a software program that UW-Madison uses to share videos with users across campus. To view videos of past Career Center workshops and events that were filmed, go to our Kaltura Channel. To access the videos, you will need to log into Kaltura with your UW-Madison NetID. From the School of Education Career Center channel, you can view our videos, divided into topics by playlists. 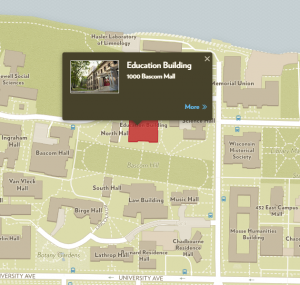 An interactive campus map is available and features information about the departments in each building as well as locations for public parking. Parking is limited on campus, so it is advisable to arrive early and to check current parking availability. Visitor parking information is provided by the transportation office. City parking is also available around certain areas of campus. Career Consultants are here for you!